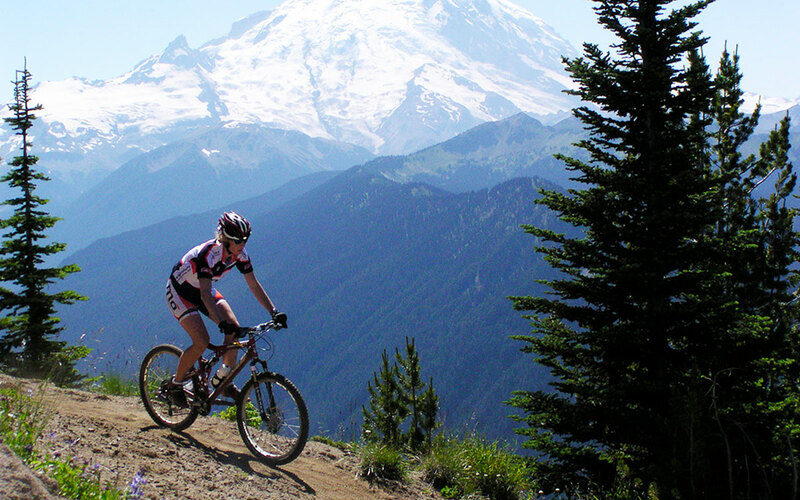 Considered one of the best spots in Washington for Mountain Biking, Crystal Mountain and the White River Corridor offer several stunningly beautiful, classic mountain bike rides. Crystal Mountain and the upper White River Corridor are packed with epic mountain bike rides to keep you smiling and breathing hard! The vertical relief is impressive—starting from 2,000 feet on Highway 410 to 6,872 feet at Crystal’s summit. Fields of densely-packed wildflowers, unreal views of Mt. Rainier and the other Cascade volcanoes, and flowy, twisty trails will keep you smiling. If the weather is not hot enough, you can always pop over Chinook Pass and hit the “dry side” with fun trails such as Little Bald Mountain. Often when there is inclement weather on our side, it is dry and sunny over there. Trails start from the back door of all the hotels at Crystal Hotels making it an ideal base for an awesome mountain bike getaway. Ride through fields of wildflowers with awesome views, sweeping big turns, lung burning climbs and sweet descents with changing scenery and trail style. Climb through an emerald green forest along the babbling Ranger Creek up to the ridge where you wind along with big views before descending down to the beautiful falls. Seen from miles away, this is an amazing and diverse trail full of everything—steep hills, widely spaced forest, and awesome views. Check out the Visit Rainier website for more trail info! Mountain bike rentals are available. 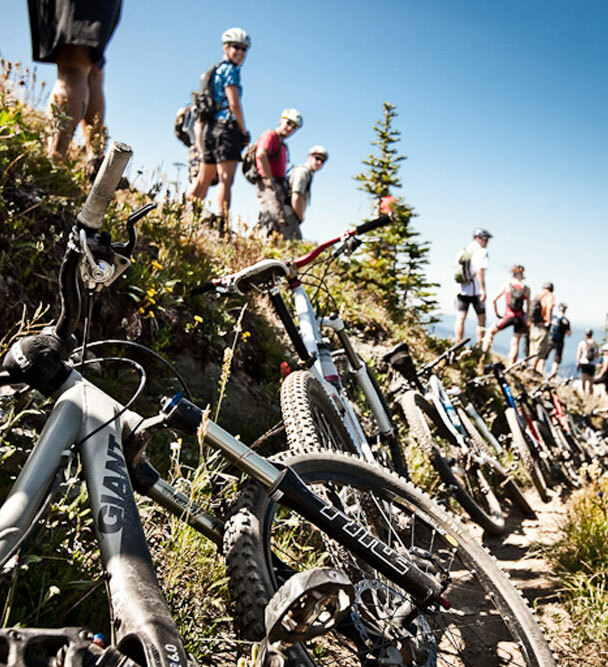 Full suspension Specialized Bikes are available at Enumclaw Ski and Mountain Sports. Finish the day back at the Alpine Inn patio looking out on the meadow and peaks, complete with cold beers and killer food. Cycling camps are available. Organize your own group for an awesome weekend!